Hello! I grew up with a professional seamstress grandmother, and all the women in my family are very good at some fiber art or other, but I always thought that the crafty gene had skipped me. Then some time in 2008 I decided that I was going to learn to sew so I could make cloth diapers for my son. It wasn't long until I realized that I wanted to make other things, and the rest is history. I'm very much interested in historical costuming but I love sewing all types of garments. Even though I've been at this for years now, I still have so much learn! 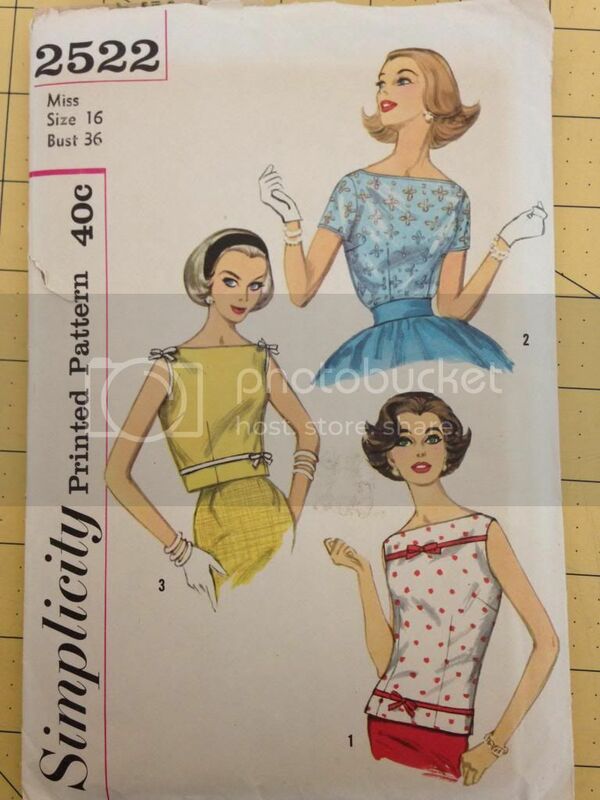 I chose this pattern to enter the garment on the PatternReview “Vintage” challenge. It’s a 1958 pattern for blouses with bateau necklines. I actually love the look of the blouse, but it has some fit issues that weren’t obvious with the muslin and I really wish I had caught before I cut the fashion fabric. That said, I am smitten with the little bows on the trim and I did get compliments on the blouse when I wore it today. For more blurb, please visit my blog. I am not sure whether to call this a mod dress or not. I am not terribly familiar with the fashion terminology of the 60’s so I’ll refrain from attaching any labels lest they be incorrect. Anyhow, this is a 1968 pattern that I bought as part of a lot in 2009. I immediately fell in in love with the scallops and the color of the green dress but for a sting of reasons didn’t get around to working on it until last July. The muslin went well and revealed that the only adjustments I truly needed were shortening the length and adding some width to the sleeves. Yay for big upper arms! Not. I also removed some of the ease from the sleeve cap because it was unruly. I cut the fashion fabric….last July…. and didn’t pick the project up again until a couple of weeks ago. Seven months sat the cut pieces somewhere in my sewing room. Seven months. I really love the dress. I love the scalloped edge and I do love the lime green, even if it is a bit obnoxious. Now I need to learn a hair do to go with it. There’s a ton more blurb on my bog.